The shamrock shot glass is also available in a boxed set of four. 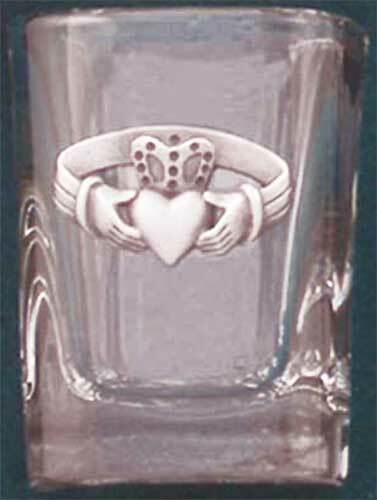 This Irish shot glass features a pewter Claddagh emblem. The Claddagh shot glass measure 2 1/2” tall and holds 2 ounces of whiskey. The dishwasher safe square shaped shot glass is made in the United States and is gift boxed with a Claddagh history card, complements of The Irish Gift House.